Waste Managers Cleansing Service Group have donated £250 to a sponsored walk in aid of St David’s Hospice Care in Newport, Gwent. Walking the 210 miles of the Severn Way in just eight days, the Severn Bridge Stumblers aim to raise at least £2000 for St David’s Hospice Care which provides palliative care for people in South Wales who are facing a progressive life-limiting illness. The walk has just been completed and proved to be one of the most challenging the Stumblers have undertaken. The final amount raised for the hospice has still to be calculated. The Severn Bridge Stumblers are all staff of international engineering group Laing O’Rourke and the hospice is already helping a number of their close relatives. 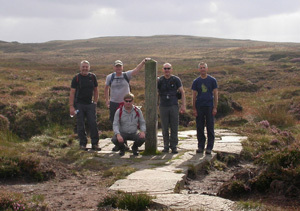 The Stumblers have already completed the Offa’s Dyke Path, Coast to Coast Path and the Welsh 3000s. Laing O’Rourke runs the maintenance contracts on the two River Severn crossings near Avonmouth and since 2010 CSG has provided all their waste requirements including the collection and recycling of both general and hazardous wastes. Picture shows the Stumblers at the start.